2. 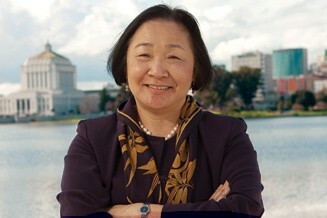 Mayor Jean Quan’s approval rating has nosedived to just 23 percent, with 60 percent of city residents saying they disapprove of how she’s handling her job, the Trib and Chron report, citing a new survey commissioned by KPIX TV. The city’s ongoing crime crisis appears to be severely harming the mayor’s standing in the community. Yet despite the low poll numbers, veteran political consultant Larry Tramutola told the Trib that he does not believe the mayor is vulnerable in the 2014 election. 3. Good government and environmental groups are contending that Chevron violated federal election laws when it pumped $2.5 million into a campaign to elect Republicans to Congress last year while maintaining government contracts, the Mercury News reports. It’s illegal for federal government contractors to attempt to sway the outcome of Congressional elections, and Chevron has amore than six hundred federal government contracts. 4. A new bill in the state legislature would ban the commercial trapping of bobcats in California and the sale and export of their skins, the Chron reports. Bobcats are being killed throughout the state and their pelts are being sold to China. 5. And the Dow Jones industrial average closed at a record high, above 14,000 points, yesterday — once again disproving claims that President Obama has been unfriendly to Wall Street.